At 11:58am today, we posted a chart stating the intraday bounce to the 38% retracement was likely over if the price was able to violate 22.17 on the downside. It stopped right at 22.18 and turned around to take out the previous high @22.58. It closed at 22.63. 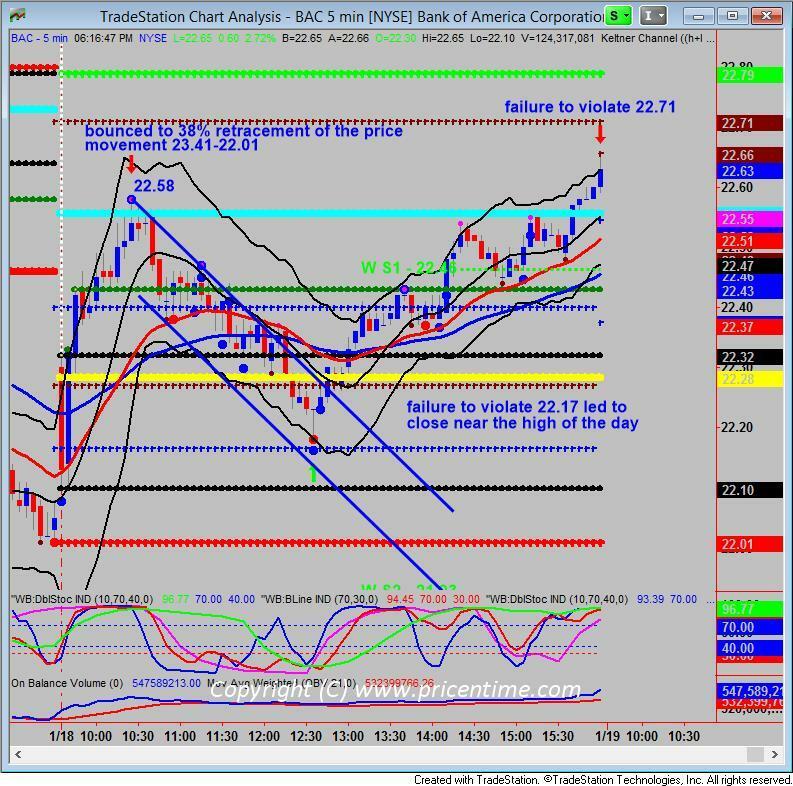 The action from 22.18 low to 22.63 was commendable on the bull side. The strength of the rally was impressive.However, it never violated 22.71 which is the high of the 3-day rolling pivot range. If 22.71 was violated, we should close the short trade. On a down phase, it shouldn’t breach the high of the 3-day rolling pivot range. 22.71 is still the high of the 3-day rolling pivot range for tomorrow. Watch 22.71 carefully. On the daily cycle basis, we are looking for it to bottom in the timing band Jan 18-Jan 31 2017. On the weekly cycle basis, we are looking for it to bottom in the timing band Feb 3 – Mar 17 2017. Most likely the daily cycle will extend to bottom together with the weekly cycle. Multiple data points project the bottom targets are 21.38, 20.12, 19.11. We have to wait and see how it reacts in the time and price target areas. Stay tuned. This entry was posted	on Wednesday, January 18th, 2017 at 6:58 pm	and is filed under Hot Stocks, Trade Recommendation. You can follow any responses to this entry through the RSS 2.0 feed. Responses are currently closed, but you can trackback from your own site.